Not valid on gift card or gift certificate.Cannot be combined with any other offers.Not valid on previous orders.Not valid on sale or clearance items.Exclusions may apply. Not applicable on gift vouchers.Cannot be combined with any other offers.Terms and conditions apply. Not valid on gift card or gift certificates.Cannot be combined with any other offers.Does not apply to shipping costs.Terms and conditions apply. US customers only. It excludes delivery costs, gift vouchers, gift boxes and alterations. Not valid on clearance. Not valid on CT exclusives. This offer is not valid in conjunction with any other vouchers or special offers. Not valid on gift card or gift certificate.Cannot be combined with any other offers.Not valid on previous orders.Terms and conditions apply. Cannot be combined with any other offers.Online only.Terms and conditions apply. Charles Tyrwhitt produces the best and finest menswear of all types and styles. They also offer the ultimate best when it comes to customer services and also with affordable prices. The business was begun by Nicholas Charles Tyrwhitt Wheeler in 1986 and they have ensured their products are sold throughout Britain and have gone a step ahead by producing some women’s wear. Apart from London, they have other stores in Paris, New York, Chicago and Washington DC and also provide the ability to shop online. They deal in shirts, ties, suits, shoes, casualwear, outerwear, accessories and women’s wear. The shirts they offer include dress shirts, casual shirts, business casual shirts, luxury shirts and evening shirts. For those who shop by fit can go for classic, slim or extra slim. Popular ranges for shirts include non-iron shirts, white shirt collection, blue shirt collection, stretch shirts and short sleeve shirts. The spring summer collections include non-iron micro spot, textured check shirts and dobby checked shirts. During explorations in order to find an appropriate shirt, clients should measure for a shirt; utilize dress shirt finder and other features. Other items that can be bought alongside shirts in Charles Tyrwhitt are ties and cuff links. Classic ties, luxury ties and bow ties are the ranges offered by Charles Tyrwhitt in the category of ties. The most popular types are slim ties, floral ties and silk ties. The official website guides clients on how they can obtain ties. Suits include complete suits, pants, jackets and vests. The most popular ranges include business suits, tuxedos, morning suits, travel suits and luxury suits. There exists classic fit and slim fit which come in different colors like blue, black and grey. Ties, pocket squares and evening accessories can be bought with this. 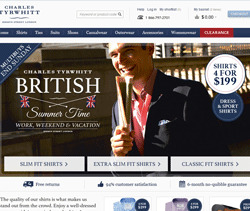 Charles Tyrwhitt deals in business shoes, business casual shoes, boots and casual shoes. The styles that exist in their market include brogues, Oxford shoes, Derby shoes, boat shoes, monk shoes and Chelsea boots. The popular ranges for these shoes are wide fit shoes, black shoes, brown shoes, Goodyear welted shoes and Made in England shoes. Shoes should always match with belts and are bought with shoe care items in Charles Tyrwhitt. Women’s wear includes shirts, casual tops, knitwear and coats. The women’s wear gives elegance, comfort, versatility and other super features. They are made to appear feminine by the nature of the bright colors that impress women such as pink and purple. Those who shop for these kind of items in Charles Tyrwhitt have the opportunity to get cozy with luxurious garments such as the soft Tyrwhitt cardigans and sweaters and chic women’s coats. Accessories in Charles Tyrwhitt cost from as low as $12.00. These include cuff links, socks, belts, underwear, scarves, shoe care and pocket square. They nicely assist you in completing your outfit and make you look smart from your head to your toe. The formal accessories also exist to add stylish appearance to one’s ensemble. The founder of this business, Nicholas Charles Tyrwhitt Wheeler says, "Not only do Charles Tyrwhitt make proper shirts but we know how to run a proper sale! Save up to 70% off all of your favorite collections." They also offer the simplest and fastest way to complete a return through free online returns. So far, they have been getting feedback from their consumers and they have recorded a 96% customer satisfaction. This can also be observed in Feefo. Items can also be purchased up to six months after receiving them. Cottons Centre, Cottons Lane, London, SE1 2QG, UK. CT: MK, James Way, Bletchley, Milton Keynes, MK1 1SU, UK. Charles Tyrwhitt believes that the right shirt can make a man's life much more enjoyable, which is why they have dedicated themselves to manufacturing superior men's shirts that are fashionable, affordable and durable. Their shirts are made of high quality materials by expert craftsmen to ensure their long-lasting wear and excellent condition. There are several styles of shirts available for men to choose from, including no-iron, silk and sports shirts. Charles Tyrwhitt also carries knitted ties, woven silk ties and handmade ties, as well as suits for work and special occasions. Their inventory even includes apparel that is perfect for outings or weekends, including rugby and polo shirts, shorts, pajamas, shoes, pants and knitwear, and they sell blazers, sports coats, and a variety of accessories. Even women can find something they love at Charles Tyrwhitt when they browse the assortment of coats, knitwear and shirts that are designed specifically for their style and figures.